A point-contact transistor was the first type of solid-state electronic transistor ever constructed. It was developed by research scientists John Bardeen, William Shockley, and Walter Brattain at Bell Laboratories in December, 1947. They worked in a group led by physicist William Shockley. The group had been working together on experiments and theories of electric field effects in solid state materials, with the aim of replacing vacuum tubes with a smaller, less power-consuming device. A small positive current applied to one of the two contacts had an influence on the current which flowed between the other contact and the base upon which the block of germanium was mounted. In fact, a small change in the first contact current caused a greater change in the second contact current, thus it was an amplifier. The first contact is the "emitter" and the second contact is the "collector". The low-current input terminal into the point-contact transistor is the emitter, while the output high current terminals are the base and collector. This differs from the later type of bipolar junction transistor invented in 1951 that operates as transistors still do, with the low current input terminal as the base and the two high current output terminals are the emitter and collector. 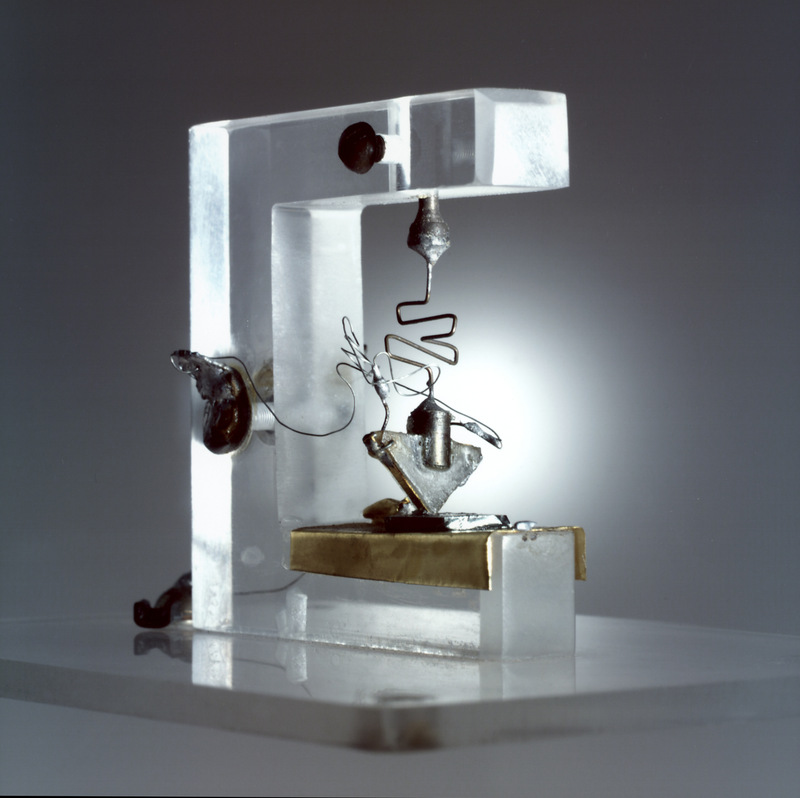 The point-contact transistor was commercialized and sold by Western Electric and others but was soon superseded by the bipolar junction transistor, which was easier to manufacture and more rugged. Germanium was employed extensively for two decades in the manufacture of transistors, but was then almost totally replaced by silicon and other alloyed materials. As of 2012 germanium point-contact diodes continued to be available for use as radio-frequency detectors. Point-contact diodes are made of other materials, including silicon, and have good microwave properties. Research continued as of 2012. To make a point-contact transistor work, a brief high-current pulse was used to fuse the wires to the germanium and create the P-type material around the point of contact, a technique called 'electrical forming'. Usually this was done by charging a capacitor of a specified value to a specified voltage then discharging it between the emitter and the base electrodes. Forming had a significant failure rate, so many commercial encapsulated transistors had to be discarded; an uncased device as could be made by amateurs could be re-formed if damaged. The common base current gain (or α) of a point-contact transistor is around 2 to 3, whereas α of bipolar junction transistor (BJT) cannot exceed 1 and the common emitter current gain (or β) of a point-contact transistor cannot exceed 1, whereas β of a BJT is typically between 20 and 200. When used in the saturated mode in digital logic, they latch in the on-state, making it necessary to remove power for a short time in each machine cycle to return them to the off-state. ^ Jump up to: a b HOME-MADE TRANSISTORS: P B Helsdon, Wirless World, January 1954. Article starts "It is quite practicable to make point-contact transistors at home which compare quite well with those advertised by professional manufacturers." Jump up ^ Voltage sensitivity of a point-contact GaAs/AlGaAs heterojunction microwave detector, A Suˇzied˙elis, S Aˇsmontas, J Kundrotas, V Nargelien˙e and J Gradauskas, Phys. Scr.85(2012) 035702 (5pp). Example of ongoing research into point-contact devices. This page was last edited on 20 June 2018, at 07:55.